Games that are tied in to TV shows are often little more than a quick cash-grab used to dupe unsuspecting parents into buying a sub-par game because their child will recognise the characters. No truer is this statement than when referring to Power Rangers Super Megaforce. Once you load up the game, you'd be forgiven for letting out a small, childish squeal of glee at the sound of the words 'Go Go Power Rangers!' blasting from your speakers. The iconic phrase is heavily embedded in the inner children of many that grew up with one of the many series that the franchise produced. Upon getting into the actual game though, you'll soon discover that there's sadly nothing in this title as exciting as the title screen. That boot-up moment is the high point, and it's all downhill from there. The game's single playable mode tasks you with running from left-to-right through a series of bland environments containing inexplicably large coins that you can collect to later purchase items. Within these levels you'll come across literally faceless enemies that you must defeat in order to progress. 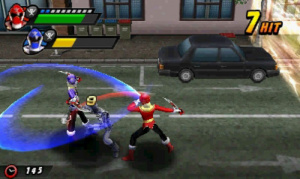 The game has a number of characters to choose from, but the sizeable roster is an illusion, as there are only a very limited number of attacks that you can use, and each ranger has access to two of them: one close range, one long range. The long range attacks are pathetically weak, and even though you can perform more complex moves such as attack from the air, these are also useless compared to the standard close-combat alternative. The best tactic to use in this game is to mash the A button, which is not enough. There is another attack that you have access to — one which requires a few seconds of charge that a reasonable gamer would assume would be more powerful — but contrary to what anyone might think, this is in fact just as ineffective as the other moves that aren't the basic A button combo. The only entertaining aspect is the boss fights. You take on the role of one of several Megazords, a common element in the Power Rangers universe, and must engage in a fairly easy battle with another gargantuan robot form. The controls are similar to the main game mode, but the combat is actually much more engaging, as you must dodge, block and attack in the correct pattern in order to best your opponent. This combat shows promise, but still fails to deliver. After trudging through numerous boring levels the player is suddenly given a glimpse into what should be the most exciting part of the game, but it's all a bit predictable and over too quickly to warrant the five previous, dull levels leading up to it. Presentation-wise, the game is lacking; dated graphics are the bread and butter for this time-warp brawler. All the levels within a particular chapter are basically identical visually, and apart from some fairly unimpressive platforming elements, often feel just the same as each other as well. 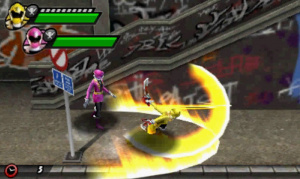 The characters and enemies move in a stiff, unnatural manner whenever they do anything, and even the special move that charges as you deal damage to others is simply a re-hash of animations from other moves. The menus are a slap-dash effort with little flair or intrigue, and serve as an effective metaphor for just how lacklustre the game is. Power Rangers Super Megaforce is an oxymoronic title to say the least. It's a tedious, boring and broken mess that feels like it was not only rushed, but made without a single shred of enthusiasm or passion. Even if you're a fan of the series, there's not enough to entertain you to make this a worthwhile purchase. The Megazord battles are much more fun than the main game, but they're few, far-between, and not enough to make trudging through the rest of the game worthwhile. Many may be tempted to try it out to relive some fond childhood memories, but there's nothing here for you aside from a disappointing, repetitive beat-em-up with nothing new to bring to the table. Even children who love the Power Rangers franchise will find little to engross them in this sadly disappointing title. Power Rangers just needs to die already. Ever since Saban reclaimed it it's been even worse than Disney's efforts, and the games are always crap. Every new series just taints what was a once good show. @LunaticPandora I agree... I see it every now and then and it looks way outdated-the villains and 'megazords' look like toys filmed up close then cropped onto the scene. I'd expect at least the special effects would look better, but no. Probably low budget, though games like these probably produce that budget. A 2/10 rating, seems about right.....just like the show. I think dishwater would shine more than this game. @Undead_terror in the original Japanese yes and they were completly seperate from the previous ones but Saban messed it up and made it the same group as Megaforce and called it "Super Mega Mode" how dumb a name is that? My 6 year old brother will be disappointed though. I don't mind the series. Fact is, I don't compare it to the others or treat it with any seriousness. Its just silly dumb kid orientated fun, even if it does need to slow the heck down a bit. Even if they are doing a big team up with past Rangers, this series isnt really for those that grew up watching MMPR, its for today's kids that'll grow up, look up the show's origins on Wikipedia, then themselves become a new generation of Sentai fans. Since this show is all about being able to change into at least 20 previous years of rangers/sentai, then can you do that in the game? Is that supposed to be a to? .... at least it's better than the first Megaforce.....? @Knuckles You have to buy the Ranger Key toys and scan them I believe. @Angelic_Lapras_King Wow. I would have been maybe interested in a bargin bin buy for MMPR, Zeo, Space and a few other teams, but not like this. The Ranger Keys are not amiibos. NamcoBandai, everyone! They used to take their stuff seriously, but now they just throw trash around like there's no tomorrow. Given how lame this season of Power Rangers is even when judging it by itself, it's not a surprise that the game is a dud. 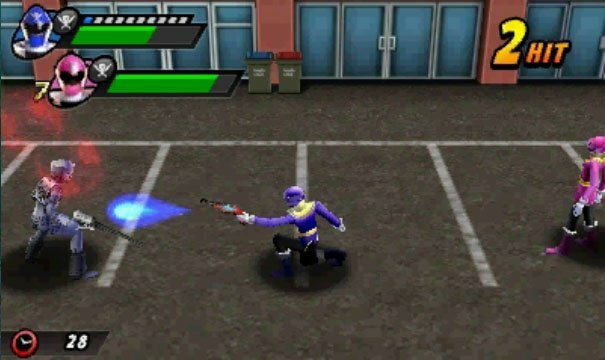 Then again, has there ever been a decent Power Rangers game? @LunaticPandora I think the Disney era gets a lot of undeserved hate in the Power Rangers fan community. Sure, they had a couple of duds, but they put together some really decent seasons. You know, a Megazord fighting game probably could be done fairly well. That'd be something I could find interest in. @Samuel-Flutter the SNES has you covered. Power Rangers is so overrated that even IMDB despises it. The show has a 6.3 rating on it. 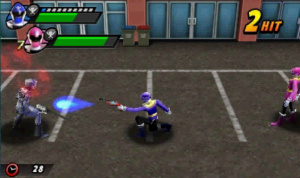 @Sir_JBizzle I have played a good old 2D Power Rangers game for pc, but I can't remeber the name, it's one that the red ranger has a star in his face. @FullbringIchigo I never played the Mega Drive version. I think at the time, I had to choose between that one and the SNES version. I remember regretting that choice, as the former had Megazord battles. Ha. @RaphaBoss Zeo vs. The Machine Empire I believe was the game... I remember that have stiff controls and choppy character movement. There was also Zeo Battle Racers for the SNES. I found that one pretty fun. It was sort of like Super Mario Kart, as it used Mode 7. I wish I still had that game as it's quite a rare cart! EDIT: A quick peruse through eBay shows that the pieces have come down drastically since the time I had looked for it... I may have to jump on a copy. Dino Charge might change your mind. They're getting back Judd Lynn as Executive Producer! He was awesome! The dork age of Power Rangers will finally be over! @Sir_JBizzle Still I liked that game a lot, specialy that level were you take enemies in the buildings. @LunaticPandora Samurai and Super Samurai weren't that bad. Some of Super Megaforce's episodes are pretty good, too. The episode where Cody from Jungle Fury shows up was awesome. The show definitely has the potential to be great again. Hopefully Dino Charge's dinosaur theme will renew some passion with the writers. There hasn't been a bad dinosaur themed season yet! @WaveWarlock ... The show deserves WAY more than a 2/10. At least it is better than Megaforce. @SuperMalleo The first series was definitely overrated. Have you watched Power Rangers: Time Force or RPM, though? Those are some of the best TV shows ever aired. The keys are just there for you to unlock the Red Rangers easier, but they can all be unlocked just by playing the game itself. Also you can scan the keys with pictures on the internet, so don't waste your money on the keys. Anyway, Personally I was interested in this, even though I knew it was shovelware trash to cash-in while the show is popular. I'm buying this when it gets a price drop, just because of the nostalgia of seeing the old MMPR team & Because I haven't played a PR game since the SNES beat 'em up. Shame a good company like WayForward didn't make this game. Also they really missed the opportunity to add everyone from all the series, it's not like this game has a varied moveset per ranger, they still recycle movesets, so I don't see why they can't simply put everyone in. The only teams that are complete are the Super Megaforce & Mighty Morphin, everyone else is just the Red rangers(Or "Forever Red" like they call themselves). After reading this review, I picked the game up to see if it's as bad as it sounds. After getting past it's poor first impressions, I discovered that it's really not all that bad. 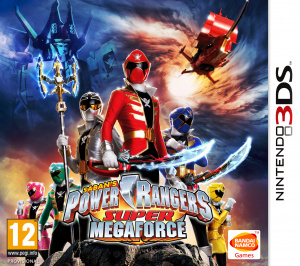 I would even argue it's pretty good, definitely better then some previous Power Ranger games (for what that's worth). Honestly, this review sounds more like a bad opinion piece more then anything else.